The Law School Admission Council has developed and administered the LSAT on behalf of all American Bar Association-approved law schools since 1948. Their national headquarters are located in Newtown, PA.
As expected. This is 10 official tests, back to back. There are no answer explanations, only an answer key, but that was expected based on the product description. Does its job. I think the absolute best way to prep for the test is simply by taking older tests. This is not an information based test, it is a test of skills - and the only way to improve a skill is through practice! I scored a 154 my first time taking the LSAT, and I am currently studying for the next one where I will hopefully do better. Still plugging away at these older tests. 5.0 颗星，最多 5 颗星Great tool for studying, but not enough on its own. It's exactly what you should expect from the product - 10 LSAT examinations from previous years. 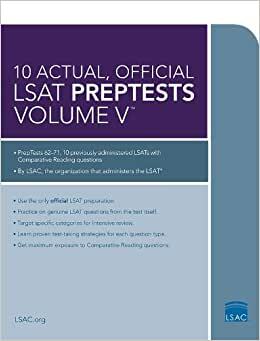 It gives you a lot of insight into how the actual tests are run, rather than just taking random questions that may have never appeared on an LSAT before. You start to see some patterns they use in the layout of each section, and it's a pretty valuable tool for making sure you have the pace of the test down. It also comes with the answer sheets and everything, so it's a complete package of everything you'll need to run practice tests before taking the actual test. That being said, I do recommend getting other material or using online resources in addition to this. Just taking a practice test isn't going to be immensely helpful beyond the pacing, and it can actually misinterpret the difficulty depending on which tests you do. This only comes with four sections per test (no fifth/experimental section) and so for things like Logic Games you're not getting a lot of variety. Knowing all of the possibilities from a dedicated Logic Games book will make it much easier to adapt on test day, rather than getting caught off guard by a new type of puzzle. I found the best way to prep was by doing questions from actual tests (rather than questions made up by prep companies), and sitting down and running timed full tests. I bought a couple these volumes (each volume has 10 full tests) to do that - check the number of the tests to see which years they are from and do several, but definitely the most recent.